Win this awesome deluxe figure play set featuring all the main characters from Star Wars: The Force Awakens! Good luck! May The Force Be With You! Watch The Good Dinosaur in theaters this Holiday Season! Until then watch this new clip entitled "Above The Clouds." Sasaki Time and Dolby are teaming up once again to bring you another awesome Blu-ray giveaway! This time it is for Warner Home video's Pan that just arrived on Blu-ray with a Dolby Atmos soundtrack! Pan uncovers the untold story of the classic fairytale (Peter Pan) – going back to the beginning to show how Peter made his way to Neverland. Teamed with the warrior Tiger Lilly (Rooney Mara) and a new friend named James Hook (Garrett Hedlund), Peter must defeat the ruthless pirate Blackbeard (Hugh Jackman) to save Neverland and discover his true destiny. Dolby Atmos is the sophisticated sound system that one will find in the very best theaters across the country and world. Filmmakers can now move sound not only around viewers but also overhead. This creates a much more immersive environment for movie watchers. Dolby is now bringing this technology into our homes. Even without an Atmos sound system for the home, you will still notice the difference through your television's speakers or your surround sound system. 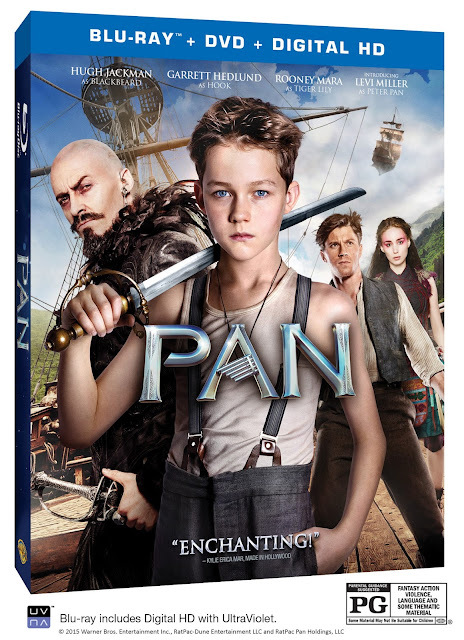 Dolby Atmos brings the adventures of Pan to life, placing viewers in the middle of the fantastical world of Neverland at home with detailed, multi-dimensional sound. Whether it’s an encounter with fairies or an adrenaline-pumping battle with pirates and warriors, Dolby Atmos puts viewers in the heart of the action. To learn more about Dolby Atmos and what it brings to the movie going experience, visit their website Dolby Atmos. And also follow Dolby on their Facebook page and also follow them on Twitter. This is a U.S. giveaway only. Dolby has supplied me with the giveaway. Two winners will each receive a copy of Pan! It's been a little over three years since Disney announced they were purchasing Lucasfilm and making more Star Wars films. After years of hype and speculation, the first Star Wars film without George Lucas, is finally here. This will be a spoiler-free review. However, I must tell you that the trailers and TV spots have given away absolutely nothing! Star Wars is simply back! Forget the awkwardness of the prequels and trying to bring The Force into the scientific world, this is the return to the spirit of the original trilogy! While there is nothing better than seeing old friends from the original trilogy back on the big screen, it is truly the action, the humor as well as the energy that has been recaptured here. 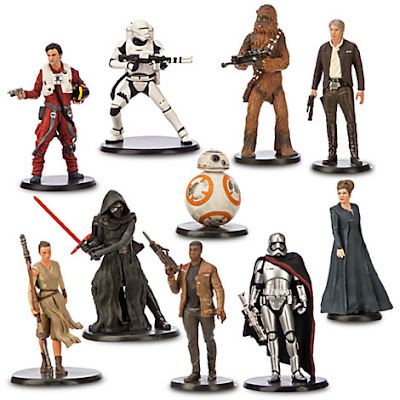 The Force Awakens introduces to us a whole new group of actors who will move the franchise forward. The new cast will impress you. 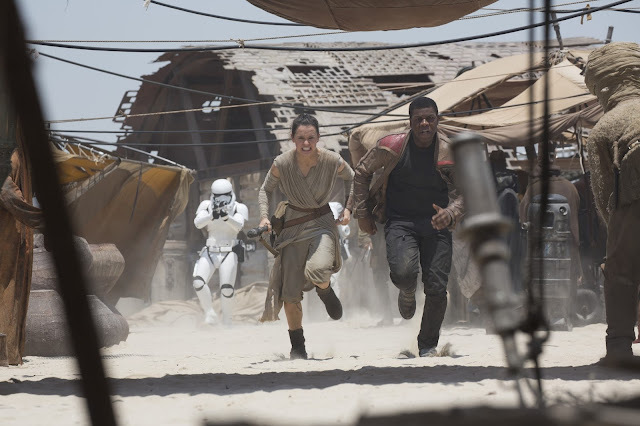 The dynamic between John Boyega's Finn and Daisy Ridley's Rey is wonderful. It feels warmly familiar and yet different all at the same time. They seemlessly blend in with the established cast of Han Solo, Leia and Chewbacca. But the real strength is Adam Driver's performance as Kylo Ren. Kylo is powerful, cruel and angry. BB-8 is a complete joy and if you haven't fallen in love with him yet, you will. The Force Awakens also recaptures the feeling of A New Hope. That feeling that just in front of you is adventure and greatness. These things were definitely missing in the prequels. The same sense of hope and wonder from the original trilogy is here in The Force Awakens. The familiarity here has as much to do with the dialogue as it does with the use of both practical and computer effects. 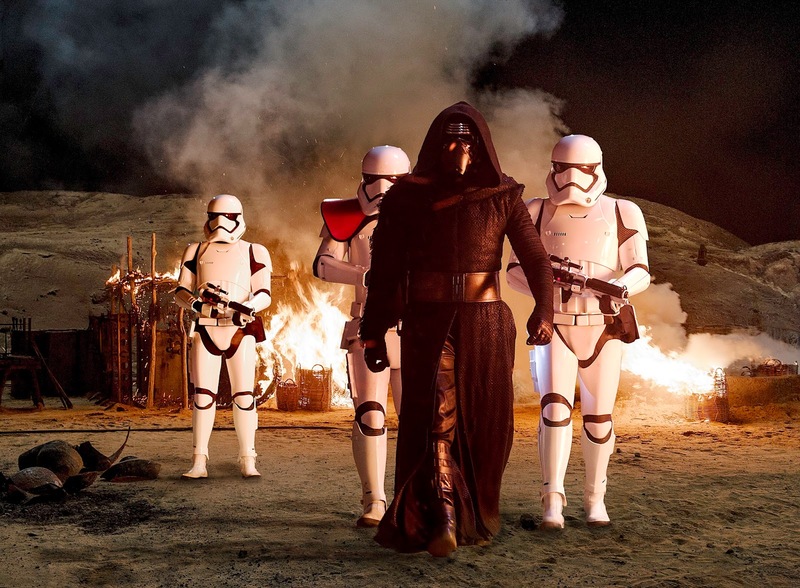 Lawrence Kasdan brought that level of familiarity to The Force Awakens. Having rewritten The Empire Strikes Back and co-writing Return of The Jedi, no one understands the characters of Han Solo, Leia and Chewbacca better and it shows here. J.J. Abrams brings with him his clear understanding of tightly controlled storytelling, with a fantastic ability of setting things up and paying them off and a real feel for action. The lightsaber battles feel more fluid and realistic than even the ones we witnessed in the prequel trilogy. Even the X-Wing and TIE fighter battles have a real sense of physicality that not even the prequels could come close to. J.J. Abrams and his team have created a film that lives up to not only the Star Wars name, but to fan expectations as well. But perhaps the films greatest achievement is that the film can be enjoyed without having seen the original trilogy. I cannot wait to see what both Rian Johnson and Colin Tevorrow have planned for the following sequels. Following the world premiere in Hollywood of Lucasfilm’s Star Wars: The Force Awakens, the film's stars were joined by J.J. Abrams and producer/Lucasfilm president Kathleen Kennedy for a chartered flight from Los Angeles to the London premiere of the movie on a custom, one of a kind, specially themed R2-D2™ ANA JET. Earlier at the premiere, stars posed for photos with a scale model of ANA’s BB-8-themed ANA JET. ANA, Japan’s largest airline, has designed three Star Wars-themed jets in celebration of Star Wars: The Force Awakens. The R2-D2™ ANA JET is the first ever aircraft in the world to feature a Star Wars character on its exterior and is a product of an agreement between ANA and The Walt Disney Company (Japan) Ltd. First unveiled at the Star Wars Celebration in Anaheim, Calif. earlier this year, the R2-D2™ ANA JET, a Boeing 787-9, started its regular flight in October and now flies to various destinations, including Europe, Asia, China and the U.S.
Star Wars: The Force Awakens World Premiere Red Carpet Photos! Tonight, the stars came out for the World Premiere of STAR WARS: THE FORCE AWAKENS at the Dolby, El Capitan and TCL Theatres in Hollywood, CA! STAR WARS: THE FORCE AWAKENS - Sydney Fan Event! 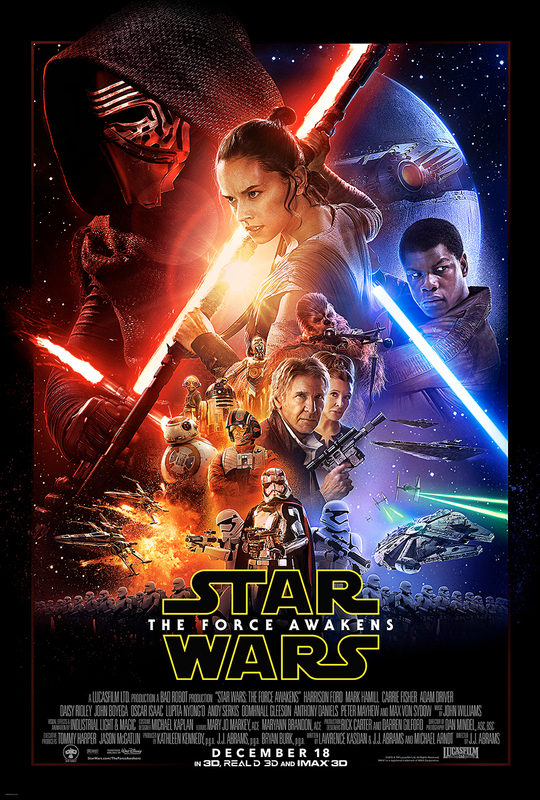 STAR WARS: THE FORCE AWAKENS - Tokyo Fan Event! New Poster for Disney's Zootopia!